It might not be what Might & Magic fans expected, but Ubisoft’s Might & Magic: Elemental Guardians is a well polished game with tons of content. But what you’ll quickly discover after a few minutes of play is that Elemental Guardians doesn’t feature much in the way of a beginner’s guide. Whether you’re just getting started or already dipping your toes into the Tower of Trials, this list of tips and tricks for Might & Magic: Elemental Guardians is sure to help you take your team to the next level. Without further ado, let’s get to the list. This one is going to seem basic, but early on Elemental Guardians is very generous with missions and achievements. Without even trying, you’ll probably finish twenty or more in your first hour of gameplay. Pretty much any time you need a little extra experience to level up or a few extra crystals to shove some more potions down a creature’s gullet, there’s an achievement you can complete in a few seconds to get exactly what you need. Some of them include: fighting battles with just one creature, defeating specific stages, and even changing your name. Pay attention to daily missions, which give great rewards for simple daily tasks. The final daily mission gives a whopping 12,000 experience on top of a few other goodies. Daily lotteries are a good source of free energy, crystals, and seals too. Once you join a guild, there are up to four customizable missions for that, too. Just pay attention to which missions are available, and adjust your farming strategy to get some easy extra loot. Before you go hog wild collecting mission and achievement rewards as soon as they’re available, take a look at how much energy you have left. When you level up, your energy is completely refilled. But unlike Dungeon Hunter Champions, any remaining energy before leveling up is lost forever. There are a few ways to dump energy, the easiest of which is simulating battles. This quickly consumes energy and instant tickets, while still providing useful rewards for progression like potions and glyphs instantly. The fastest way to dump energy is simulating battles. There’s a limit to how many you can use at once, but the numbers are separated by difficulty level. Take advantage of this once you finish the seventh stage of each area. You won’t gain any experience, but any potions more than make up for the loss. Once all of your simulations have dried up, your best bet is to farm the first stage of any area. Don’t pick a difficulty level that’s too high, even if you can successfully finish it. The objective is to finish as quickly as possible. Trash glyphs can be sold for crystals, and creature drops are always useful for rank or skill ups. As you complete missions and start progressing, you’ll quickly amass a decent collection of seals, the premium currency in Might & Magic: Elemental Guardians. It might be tempting to blow them on single summons or even *shudder* energy refills, but that would be a mistake. The best value for seals is the special Advanced Soulstone Case costing 950 seals. You might end up with some trash creatures, but if you’re lucky you’ll end up with a few two-star or three-star creatures than can push you well into the mid-game. Even bad ones are useful as food. 950 seals might seem like a lot, but if you play regularly you’ll get there. There are plenty of ways to get more seals in Might & Magic: Elemental Guardians, and even casual play can net you more than 100 per day. Or, you know, actually spend money. A healthy dose of early epic soulstone summons are sure to get you started on the right foot. There’s nothing more frustrating than burning through the first few stages only to suddenly slam into an unbeatable group of enemies. For players who are new to the genre, it might feel like the difficulty curve is way out of whack. For veterans, it’s nothing new. When your team struggles to finish any stage, don’t bother moving to the next one. Go back to the first stage of any area and farm it until your team is stronger. Turn on auto battle and set your phone aside. You’ll improve through higher creature levels, ranking up, evolution, new glyphs, or even finding new creatures. Any rewards at all are useful, so don’t feel like you’re wasting your time. Once you start progressing a bit further, you might want to go back to the first few stages and farm advanced or nightmare difficulty. On top of experience and glyphs, there are a few incredibly useful creatures available in advanced difficulty. More on that later. Eventually you’ll lose a battle, and the game will recommend upgrading your glyphs and trying again. Without any kind of strategy for glyph optimization, you might as well flush your crystals down the toilet. Early on, try to farm up vitality glyphs and equip sets of them for the 20 percent HP bonus. 20 percent is huge early on, and HP is the most useful stat for early progression. Also stick to flat bonus glyphs rather than percentage bonus, because they’re much more beneficial when your creatures have lower base stats. Feel free to upgrade your best glyphs a few times, but stop at either level four or seven. 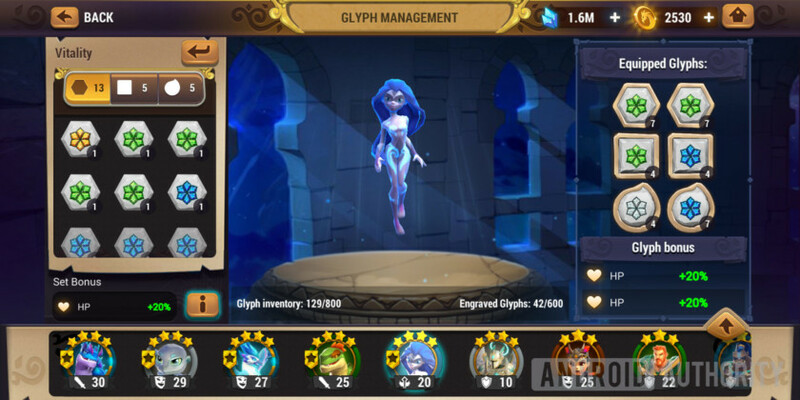 Glyphs gain extra bonus stats at those levels, but any higher and you’re going to burn a lot of crystals for a low chance at success. There is one exception to this rule. There’s a mission for your first fully maxed glyph (level 16), so grab that when you have crystals to burn. After that, wait until you start collecting better glyphs from the Glyph Dungeon before committing any more resources. With all of the rewards you’re pummeled with when you start Might & Magic: Elemental Guardians, it can be difficult to know which one is most important. So I’ll just tell you: it’s magical books. Magical books are used for leveling up skills and evolving your creatures. The right skill ups can turn a mediocre creature into an absolute monster, so hang on to your first books. Unfortunately, skills ups are random. So if you’re committing to leveling up a creature’s skills, you want to make sure all of that creature’s skills are worth leveling. When you start running low on books, you can farm up more in various parts of the Dragonmist Islands. Just think twice before you start using them, or you’ll be kicking yourself when you really need them later on. In some games of the genre, the developers are nice, and include notes for each monster about whether or not they’re useful. That’s not the case in Might & Magic: Elemental Guardians. You’re left to your own devices when it comes to figuring out which new creatures are useful. You can bet that creatures with more natural stars (the number they start with) will have better stats, but skills are what really matters. You might not need a purge or poison skill right now, but I’ll guarantee you’ll want one once you start venturing into the Tower of Trials. AoE buff, debuff, healing, and damaging skills are what you should look out for. It’s worth looking at their upgrade paths, as well, since a two-turn debuff is so much stronger than a one-turn debuff. One of your first major goals should be to establish a balanced team of nat-2 (naturally two stars) creatures. A good nat-2 creature is better than most nat-3s, and they are critical to having the right team composition. The ones you start with are a decent place to start, particularly the Stone Guard. Don’t hesitate to level and rank him all the way up to five stars. You might not want to start using up your magical books, but at least he’ll remain useful for a while. A good nat-2 creature is better than most nat-3s, and they are critical to having the right team composition. Here’s a quick break down of some of the best nat-2s currently available. The best early healer is the Water Nymph, which can only be acquired from summons. If you manage to pull her early, count your lucky stars and add her to your team right away. A few other useful summons are the Earth Basilisk, which has an AoE poison, and its cousin the Water Basilisk, which has an AoE freeze. You can skill up the Water Basilisk’s second skill to make it a two-turn AoE freeze, which can stop even boss mobs in their tracks. If you have bad luck with summons, there are a couple of creatures that can be farmed from stages. The first is the Arcane Bird (water), which can be farmed from the Mystic Forest on advanced difficulty. It’s a powerful support creature with low requirements on its first evolution. If you get the right evolution skill, it also gains self sustain in the form of life steal. A bit later, try to farm up a Mini Golem (Air) from Sunken City’s advanced stages. He’s a decent tank to add to your team until you come across something more powerful. Keep in mind that might be a while since you don’t come across nat-3 creatures very often, let alone useful ones. Right after ranking up your favorite creature, it will fall all the way back to level one. You have the option to make them even stronger by giving them potions, but that’s not the best long term strategy. First of all, if they’re in your main team, they’ll gain experience as you farm for evolution materials or glyphs. It might take a while, but you aren’t missing out on anything, since even a level one creature is more powerful than the max level version of a lower rank. To rank up in the first place, you need to consume a number of creatures of the same rank. Generally, you’ll want to hang on to any nat-3s or nat-4s you get, even if they don’t seem immediately useful. That makes the best fodder nat-1s or nat-2s that you’ve leveled and ranked up. Leveling these in battle is tedious, so this is where potions come in. With a decent stockpile, you can rank up your main team members as soon as they hit max level. It’s the least you can do to give the poor creatures a drink before they’re consumed for the greater good. PvP doesn’t play a very big role in Might & Magic: Elemental Guardians, but it’s worth doing. Not only is there a daily mission to step into the arena three times a day, there are fantastic rewards available. Plus, you don’t even need a strong team to get them. Each victory will net you reputation points, which you can redeem in the reputation shop. The first thing you want to buy is a magical book, which can be purchased once every three days. As stated earlier, books are the most important item in the game. If you have any extra reputation, the next best purchase is a minor soulstone. Legendary fragments are nice, but you need so many to get any payout that it’s not a worthwhile investment. To guarantee you get your victories, leave a single weak creature on defense. You won’t shoot up in the rankings, which is good because you’ll be matched against worse players. You’ll also have a steady stream of revenge matches available in your log. More free wins for the taking. One part of the game that you have a bit more freedom with is your character’s magical house. You’re technically a student at a magic school after all, and in classic Harry Potter style, you have to pick a house. You can choose from Anima, Materia, and Chimera. Pick whichever one suits your play style, and don’t stress out about it too much. It has a much smaller impact on the strength of your team than you might thing. If you want to switch things up later on, it’s not too expensive to reset your skill choice. If you want to focus more on supporting your creatures in battle, pick Anima. To boost your creatures’ defenses, opt for Materia. If you just want things to die faster, go for the attack-focused Chimera house. There’s a lot to go through in Might & Magic: Elemental Guardians, but these tips should be enough to get you a nice head start over other fledgling wizards at Akadimia. Fortunately, the game attracts a friendly and helpful playerbase, so don’t hesitate to get advice from the in-game global chat. Do you have any more tips and tricks for Might & Magic: Elemental Guardians? Let us know in the comments!